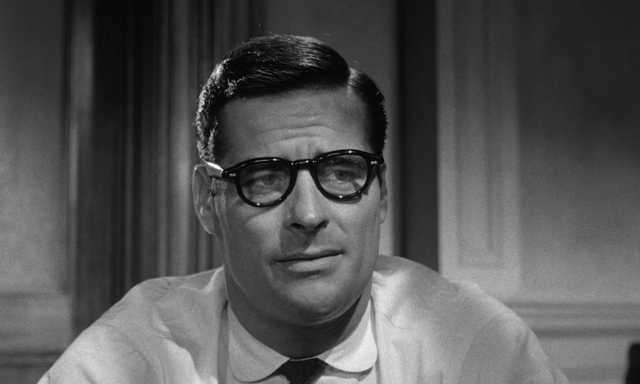 Sidney Lumet’s directorial debut is a snapshot of the American judicial system in action. Twelve average New York males convene in a very small jury room on a very hot day in order to reach a verdict in a murder trial. Almost everyone wants to vote guilty and get on with their lives except for Juror No. 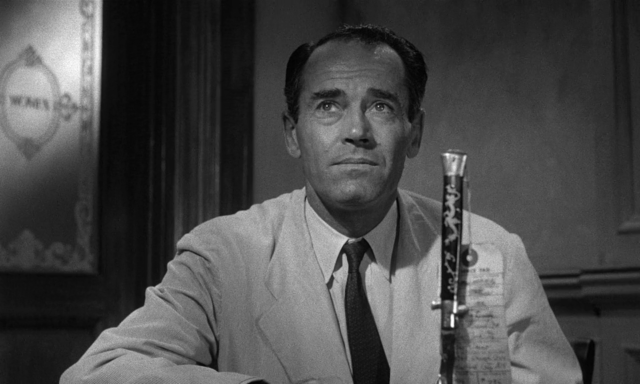 8 (Henry Fonda), a conscientious citizen who insists on establishing reasonable doubt. Arguments are made, cigarettes are smoked, murder weapons examined, diagrams drawn, and prejudices revealed. Firm opinions weaken and reverse; voices get raised, the clock ticks, and a ghetto kid’s life hangs in the balance. Lumet’s direction and camerawork steadily builds pressure into the plot. Things start out casual, but wind up so close and tight you can count the pores on the actors’ noses. Fonda is good in a role well-suited to his extra-large sense of human dignity but the stealth giant in this actors dozen is the ferocious Lee J. Cobb. Jack Klugman, E.G. Marshall, Martin Balsam, Ed Begley, and Jack Warden play some of the other jurors, and a better assemblage of grizzled method actors shouting at each other won’t likely come again. 12 ANGRY MEN was originally written for television, it is a true classic of the anti-McCarthy message era, and is not to be missed. 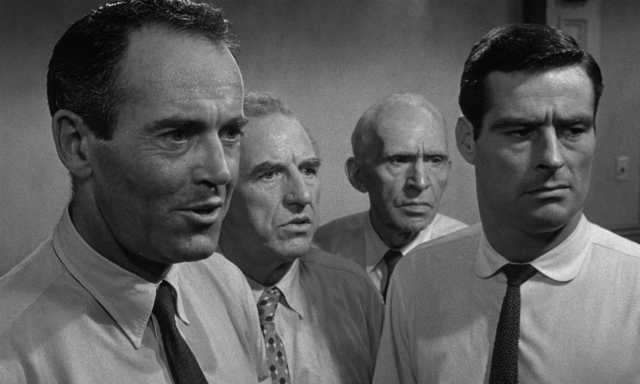 Twelve Angry Men is a tightly wound top of a movie. 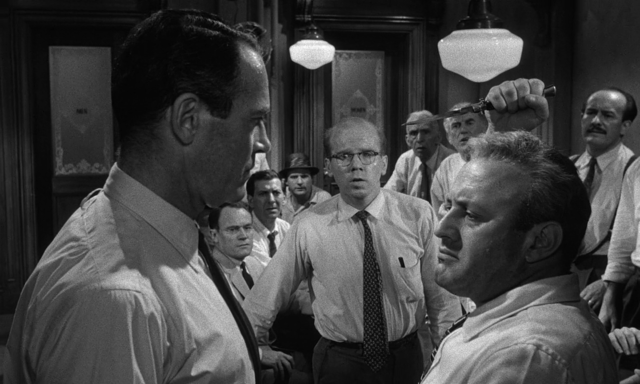 Each scene ratchets up the tension another notch as Henry Fonda’s character tries desperately to open the minds of his fellow jurors. The setting — a claustrophobic jury room in the dog days of summer — superbly augments the suspense. Operating within the constraints of a small budget, first-time director Sidney Lumet tightens the noose by accentuating the throbbing pulse of the ceiling fan and slowly narrowing his shots on his characters as the film approaches its climax. 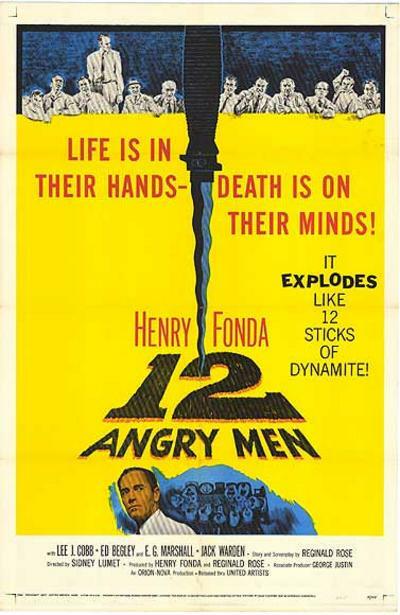 Based on Reginald Rose’s well-known play, which had been adapted to the television screen three years earlier, Twelve Angry Men boasts a series of excellent performances by young actors who would soon become household names, including Jack Klugman, Jack Warden, and Martin Balsam. However, it is the film’s established stars — Lee J. Cobb, E. G. Marshall and most importantly Fonda — who play the leads, delivering the goods like seasoned pros. The film has instructional value as a study of the inherent strengths and weaknesses of the jury system, but its real value is how it allows each member of the cultural mosaic of a jury to develop into distinct, damaged, and interesting characters. In a well-crafted metaphor for the broader outline of society, the jury members must confront their prejudices in order to see that justice prevails. 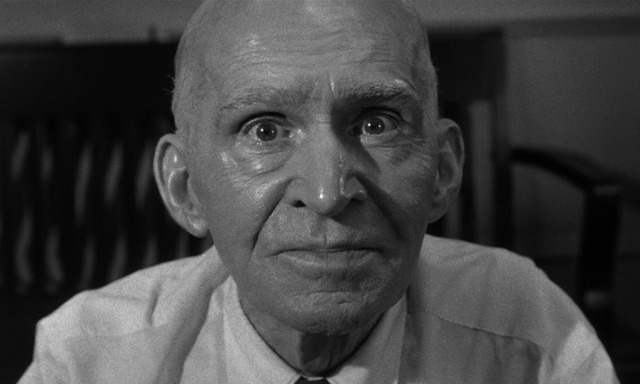 Nominated for three Oscars, Twelve Angry Men ran into the juggernaut of Bridge on the River Kwai and came up empty handed. 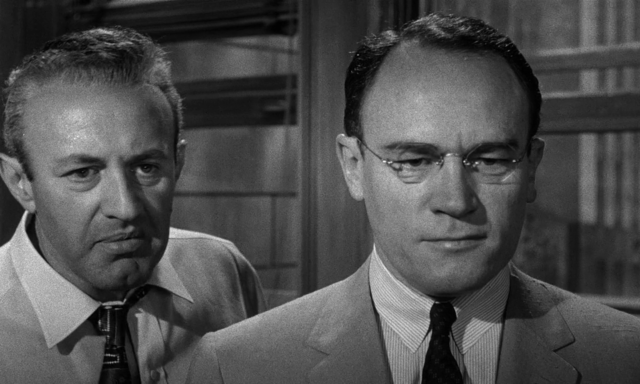 Henry Fonda, Lee J. Cobb, Ed Begley and Jack Klugman lead the distinctive cast of jurors whose character portrayals are “perfect in every detail” (The Hollywood Reporter). 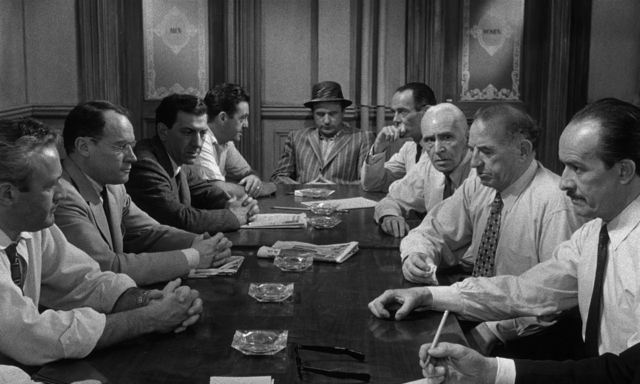 With its star-powered cast and four Oscar nominations including Best Picture, 12 Angry Men is a powerful, suspenseful and “fascinatingly entertaining film” (Los Angeles Examiner). Eleven jurors are convinced that the defendant is guilty of murder. The twelfth has no doubt of his innocence. How can this one man steer the others toward the same conclusion? It’s a cast of seemingly overwhelming evidence against a teenager accused of killing his father in “one of the best pictures ever made” (The Hollywood Reporter).